A package that aggregates events, metrics, and other activity logs into an audit log that can be used to drive graph, dashboards, and other data-driven insights. A package that incorporates Laravel's Artisan CLI command components to integrate the assets from builds into Blade views. A package that uses Gulp tasks to pre-process CSS, JS, fonts and image assets into optimized builds that modern web projects need. 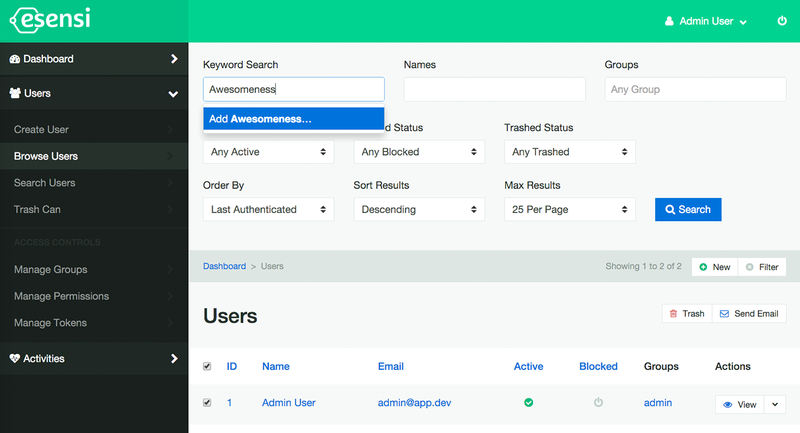 It's a great front-end package for Laravel applications. A package that provides the foundational components of Esensi. This package provides core patterns and commonly extended base classes and traits to all other packages of the Esensi platform. A customized fork of the Laravel framework that provides many of the Esensi components in a fresh install. This is basically awesome Laravel boilerplate application. If you are starting a new Esensi-based project then you should start by forking this repository which includes all available Esensi component packages as Composer dependencies. A package that extends Laravel's Eloquent ORM with traits suitable for validating, purging, hashing, encrypting, and soft-deleting models with ease. It also supports short-hand for model relationships. A package that returns the familiar namespaced translations and configs from Laravel 4 to Laravel 5 installations. It also adds namespaced aliases and YAML configs for better package development. A package inspired by the simplicity of a static site builder like Jekyll, it uses flat files comprised of Blade and Markdown views to automagically map routes to appropriate static pages. This package provides a functional blog complete with RSS feed and XML sitemap. A package that proivdes mail parsing drivers for Mailgun among others service providers. With this package it is possible to track the open, click, bounce, spam, and other delivery metrics of popular transactional mail services. Your Laravel apps can not send and receive email. A package that provides complete user management including group and permission access controls, authentication, intrusion detection, throttling, and more. Fully integrated with esensi/activity, this package makes it possible to also monitor and track key user stats like number of registrations and attempted logins. Want to work with us on great Laravel applications? Ready to have us build your next Laravel app? © 2014-2016 SiteRocket Labs – Esensi is released under Private and MIT Licenses.